For those of us who are more plagued than most seem to be with this issue, I just wanted to share this to demonstrate exactly what we're up against. 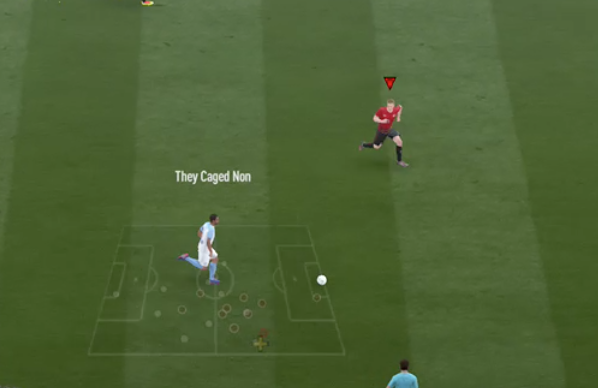 This is indicative of 90% of my games in FUT. 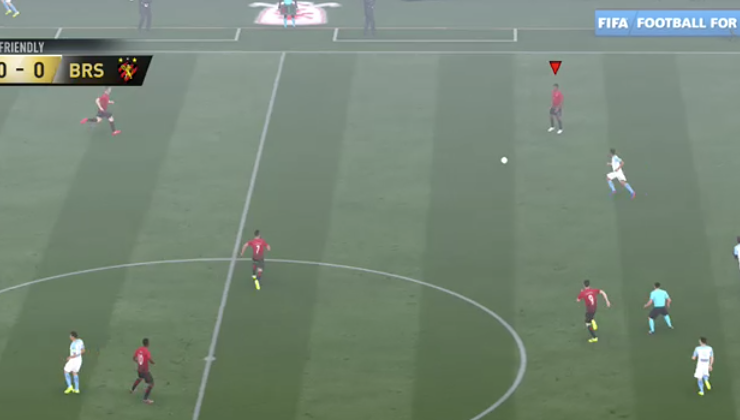 This is how far the ball actually goes - the AI deciding in its infinite wisdom that Shaw (who was 10 yards behind him as he played the ball is the intended recipient. Now imagine this is what happens for you in 9 out of 10 games you play. Welcome to hell. What assists do you play with? I believe it's assisted for passing, through balls and shooting and semi for crosses which seems to be the norm? Did you do a short pass or a through ball? Sometimes when I try a through it plays it to wrong player. Granted it's normally not THAT far off, but happens more often when trying to play through balls. No it was a normal pass (A) - I get the occasional through ball to the wrong player too which I can understand if you have multiple players making runs. The dashes indicating a normal connection and the X's indicating a brief (split second) spell when something isn't right, and thus it only registers part (or none - depending on the severity) of the command. I experience similar when shooting, player switching etc - if you're trying to do a command then only part of the command registers, an example would be trying to do a fake shot and only having one of the two buttons registering as the other one was during the 'bad' time, so you end up just doing a shot instead as it's only partially registered the input. Not explaining it very well but hopefully you get my gist! no, that's not button delay .. button delay is when you press the button and the player takes ages until he does the action! what happened to you is the sweet ol' SCRIPTING! it's when the game decides you shouldn't win so it keeps getting the ball back to your opponent in ridiculous situations until he scores! I have to agree. bullsh*it scripting happens when in lead or past 75th minute usually. Thats the point when they start messing passes so opp can get on the ball, make reasonable pressure and you cant just pass around doing nothing. This has to be something else. This doesn't look like the button delay I'm experiencing. 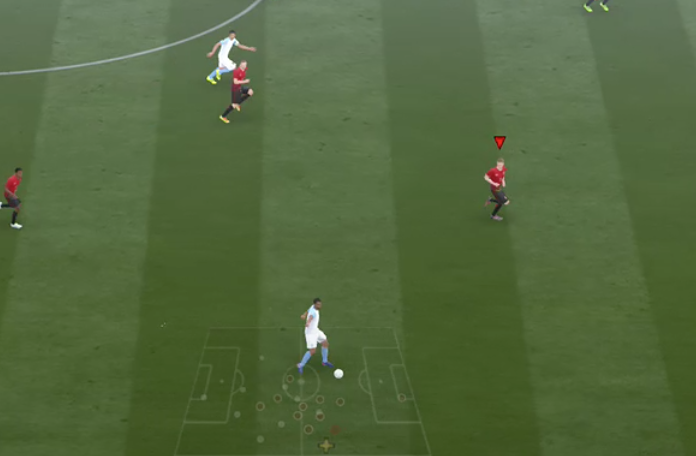 My player would have taken a step in the direction he's facing, then try and turn around. The pass could've gone either way obviously. Your player's movement looks good. To be honest i'm just using 'button delay' as a catch all term for severe latency problems. i think u attempted a through ball for origi...but the ** player switching decided u tried a through ball for your lb..who is behind u...this happens very often when i play..through ball not going to the player i intended to pass to...its because of the ** broken player switching in this BS game...and in corner kicks and crosses the player switching is broken..resulting in free headers for my opponent...the patch is supposed to have fixed this issue but as usual this issue and lag has not been fixed..
Well your issue isn't button delay, so the thread is already about something it is not. And he's likely more correct on the issue than you are. 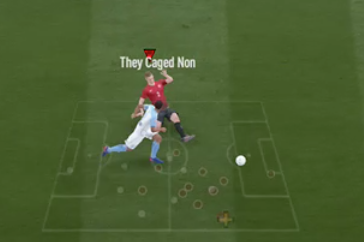 I lost a game yesterday because instead of my defender clearing the ball like I told him to he played a 2 yard pass back to the keeper and the opponent just tackled the keeper and scored. So yeah, I would be inclined to believe your issue here is more to do with **** scripting than anything else. He receives the ball with his winger, and I correctly read that he's going to knock the ball on, so I maintain distance ready to make the tackle further up the field. I point towards the ball (i.e. away from the opposition player) and inexplicably, my player homes in like a missile on the player, and thus what should have been a well timed slide tackle is half a mile from the ball, because of a change of direction that I DID NOT instigate. Note that I'm controlling this player, not the AI (allegedly). Here's all the cheesy goodness in full. It's inexplicable. 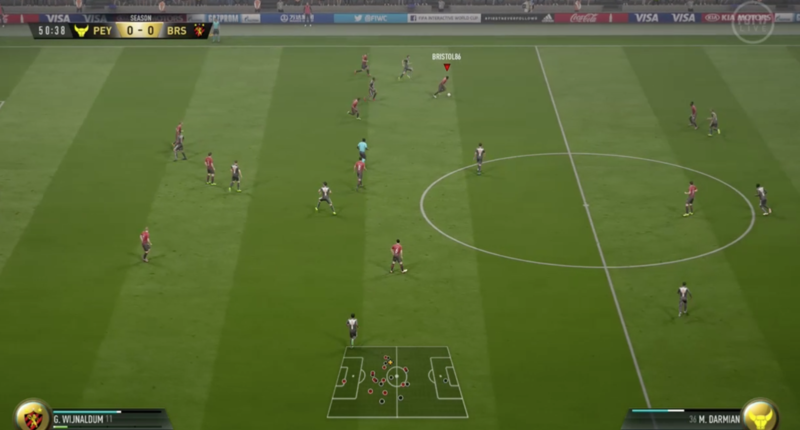 I'm pointing at the ball the whole time but my player changes direction by around 90 degrees, in direct contradiction to what I'm doing with the control pad. Again, this one isn't really a 'button delay' issue, but something weird is happening. This isn't normal gameplay. But 90% of games are like this for me now, up from about 50% at the start. Nothing has changed at my end. The issue in it's simplest form simply is latency related. Button delay is more a symptom than a cause here. Basically 90% of games (for me) have a 'feel' about them that 10% of games don't. When I get one of these 10% games....oh man, the game is awesome. Win or lose, it's a joy to play. But when the game has this 'feel' to it, it's basically unplayable. I still play it - what choice do you have when you're addicted haha. But there is a fundamental fault going on to be basically having to fight your team for the entire 90 minutes in almost every game you play. Everyone has frustrating games, the odd bad connection game or whatever, but this is fundamentally something very wrong going on. It's not 'scripting/handicap' so please can people not focus on that. I'm not taking about the odd moment that feels like you don't have control of the outcome. I'm on about entire games, entire days of not being able to play because something isn't right with the connection. It's not even 'lag' - it's not the jittery/stuttery lag that you'd get if you were playing on a connection that wasn't up to scratch. But there's no doubt in my mind that it's a matchmaking/latency issue. Everything is like a half second off. The game itself is 'fluid' in that it doesn't stutter or anything, but the delay between pressing for something to happen and that thing actually happening is the common theme - what I'm posting above are examples of odd things that happen during these games, they're not the problem itself. Have to say, I did enjoy my annual one month of button lag-free fifa before succumbing to it yet again. Been an issue for me going back to fifa 12 and there's not once been any official comment on it from EA. Been with Virgin and then BT in this time and on no other game do I experience this. I'm playing about a second behind the actual game and I can't do anything about it. David Silva is taking about 3 seconds to turn and switching between players is a nightmare. I was getting quite good at this game when I didn't have button lag and now it's ruined it for me. Same here @Coops - at the start it was maybe 1 game in 2 now it's literally almost every game. I'm lucky if I get a couple of games per week without this fundamental crippling issue. I'm pretty much only playing friendlies now, you can't play in seasons with it, it's impossible. 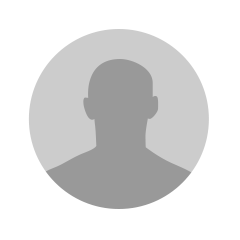 I've also had multiple ISP's, hundreds of pounds thrown at hardware (routers, monitors etc.) and to no avail. It's simply not a problem at my end, i've exhausted every possible line of enquiry. The worst thing is unless you know any better the clips just make you look absolutely **** at the game. The tackling one especially, it just looks like i've made a horrendous error of judgement - but what's happening is something completely different to what I'm telling it to do. It really is endlessly frustrating. for me it often feels like what i see on screen is out of phase with what the servers see, so when you press the buttons in response to what you see, you are not really doing the right thing. i.e. your player looks square when making the pass but in reality he isn't, hence the weak pass. Or you are tackling to a spot. I also feel at times that controller inputs are buffered and then executed at inopportune times. I can sympathise. I think I may actually have similar issues. Has anyone passed the ball back to your keeper, you frantically press A or X to get rid of the ball, the keeper literally turns around and does a really light pass into the goal? It's happened to me twice. It's quite possible I'm just s*** but I've never done it before in my 8 years of Ultimate team. Out of curiosity. Have you tried port forward your Xbox or disable DMZ on the Xbox?